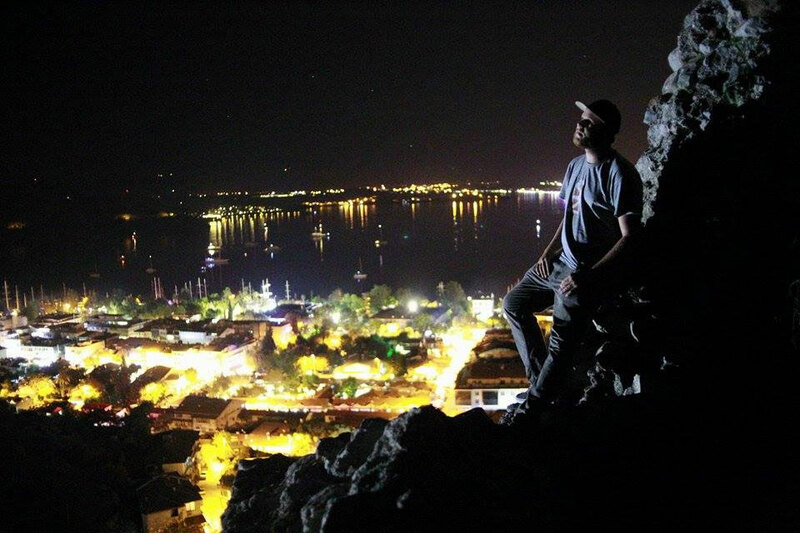 "Untouched Virgin in the Land of Light" is the meaning of the ancient name of the town of Fethiye. The Turks got a beautiful spot on earth here. The city, which is located on the south coast, lives mainly from tourism and I can only imagine how busy it must be here during high season. Above all, Englishmen, Russians and Chinese come here. But I'm not in the main season here and the city is quiet, cozy and familiar. The Hostel "El Camino" which I moved in is located on a hill opposite the marina and offers not only a good possibility to dine and drink, but also a great view over the city. Here I liked to spent time with some cups of Turkish coffee or even a beer, to catch up with my travel reports, update my diary and bring you up to date as soon as possible. 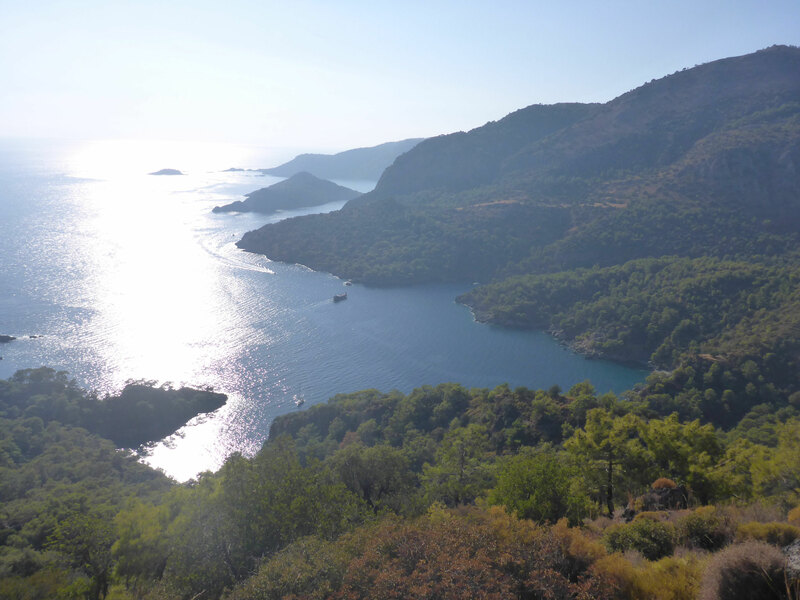 To get it straight to the point: Next to Crete, Fethiye is one of the most wonderful places on my trip so far. I planned to stay for two nights, but I spent eight. Green hills and mountains line the coast, which has many bays, and runs along the sea in countless turns, like a snake. 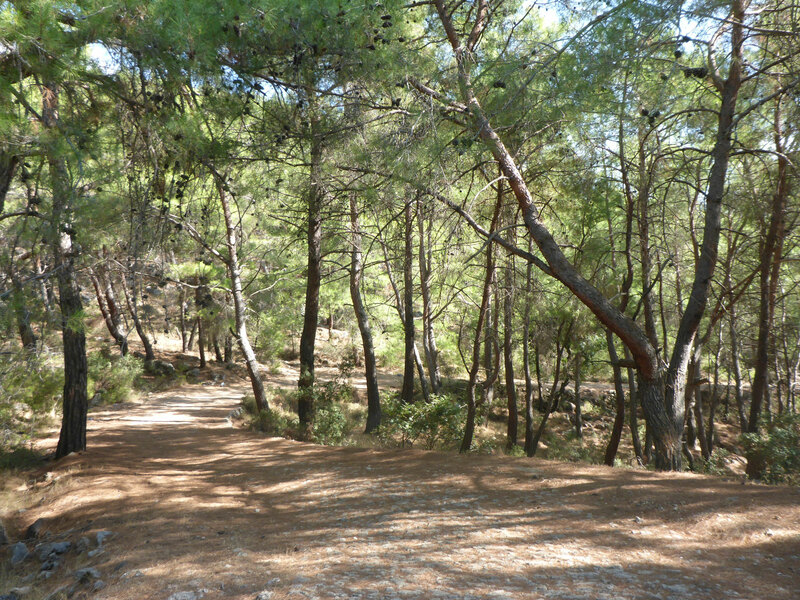 Perfect to hike, discover idyllic and abandoned places and to enjoy the many Entertainment possibilities of the region. In addition, Fethiye already belongs to the ancient Lycia region and has a lot to offer, both, historical and archaeological aspects. And that's exactly what I did. Some history and much, very much outdoorsport. Of course, I would not want to deprive you of my Highlights. Everywhere in the city are testimonies of the former Lycan culture to be discovered. The gigantic stone graves can be found everywhere. They are partly surrounded by streets or in the garden of a public institution. For more than 2,000 years they are already stay within the permanently populated area, together with different cultures. 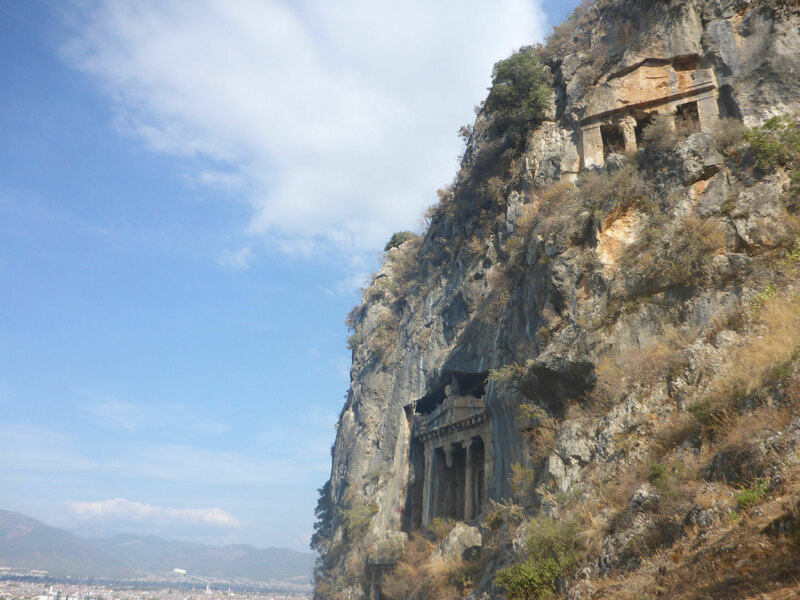 Flagship of Fethiyes are the cave tombs above the town. 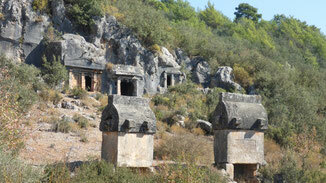 With a lot of craftsmanship, the Lycians have shaped the cave entrances as gigantic temple entrances. Columns, doors, windows and gables of enormous proportions were struck out of the rocks of the mountain. 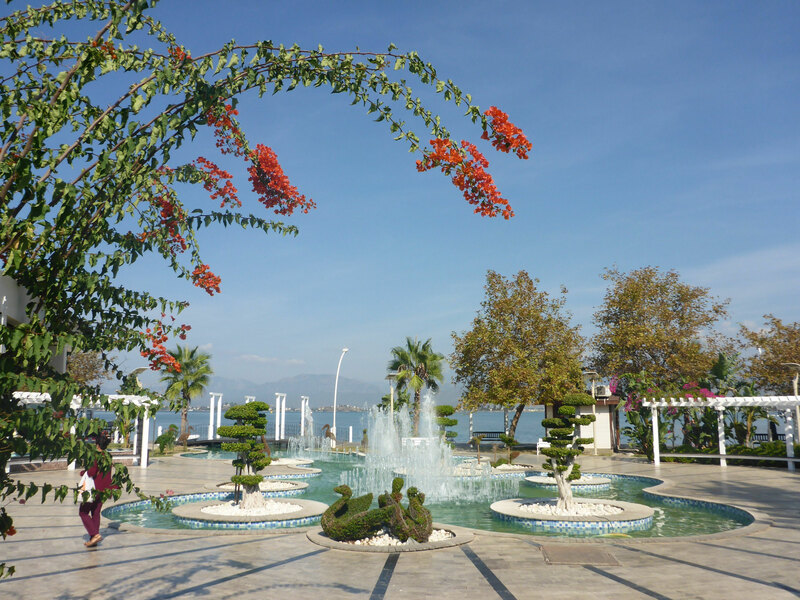 The promenade along the coast is superbly furnished with beautiful parks, various monuments and water games. The Fethiyeans are particularly enjoying shaping plants. Because these plant cultivations (mostly animals) are almost everywhere. Exciting are the many markets that can be visited here every day of the week. Fresh, tasty and inexpensive, hundreds of merchants sell their goods here. High above the city are the ruins of a medieval castle. I had experienced this once a day, but my Chinese roommate 静 芸 芸 was kind enough to celebrate my 29th birthday up there with a bottle of red wine. A magical view. Perfect birthday. areas in the world, many professionals and hobby pilots from all over the world come here, too. And thanks to tandem technology, amateurs can also test their dizziness. Some agencies offer this in the surroundings and I have spent hours negotiating with them to achieve an affordable price for me. In the low season this worked quite well and then it was fixed. I have booked during breakfast and already an hour later the shuttle of the agency picked me up at the hostel. Because of the bit of mountain sports that I like to do, I know that altitude is no problem for me, but without something solid in your hand or under your feet? which is about 2.000m high above the bay of Ölüdenz. The beautiful bay will be the goal of our jump. 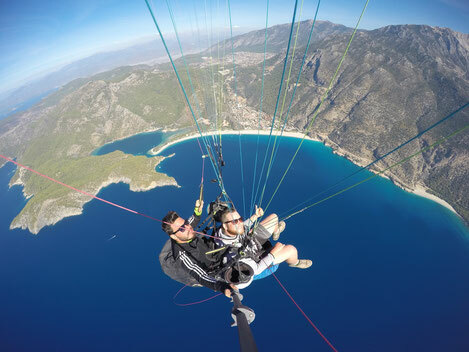 Mert (TR), a professional and also paragliding acrobat, will be my pilot. No man of great words. He fasten me, fastened himself to me and the umbrella to us and asked me to run. Just so ... do not stop ... the steep slope down. An awesome feeling when the chute collects the air under it and you slowly losing the ground under your feet. Thanks of thermal lift we soared a little higher, just avove the mountain, and flew out over the sea. Words cannot describe how the mix of view, wind, noise, freedom and the sun feels. I had absolutely the best weather. Not a single cloud in the sky and the wind is also perfect according to Mert. After about 20 minutes glide (I lost any sense of time), Mert asked me if I wanted to have some acrobatics? Well, as long as I only sit and do not have to do anything, gladly. I replied. And it was on! Mert is a freak! He flew a lot of loops, freefalls and steep curves with me. I totally enjoyed it! Simply stunning. 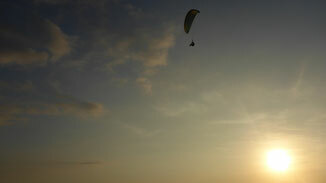 We glided along the coast a little further, and set off on the promenade between all the passers-by to the landing. A totally awesome experience that I would like to repeat every day! Actually, I wanted to wait until I am in Southeast Asia. So far the diving would have always been connected with immense costs. Here, however, I could negotiate with a small family business an unbeatable price for a try-dive. By boat we went out of the bay of Fethiye in the morning to a very nice, small bay. On the way, the dive instructor explained to us a few basic rules and other basics on the subject of diving. I shared the boat with the crew, three experienced divers from England, one British family and two Turkish girls, with whom I was allowed to dive for the first time with oxygen. 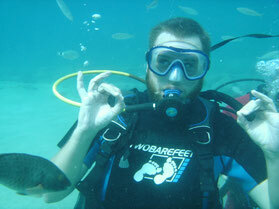 A funny, but totally awesome feeling to float under water totally weightless. I have always been a fan of water and I believe since that day I am also a fan of underwater. Impressive that even during the dive one of the Turkish girls wore their headscarf. The two had some problems with the breathing and the pressure balance, so one of the guides took me, who probably noticed that everything is fine with me, and went with me a bit deeper and further. Of course, we also fed fish, which is part of the tourist duty, but that would not have been necessary in my opinion. I wanted to go further and deeper ... 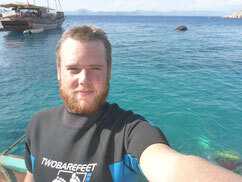 But at 8m depth it was final and I had to go back to the boat. After lunch (spaghetti-bolo) we went to the second dive with about 30 minutes. I am loving diving and on the boat I almost made a booking for a diving license. But I still wait until Thailand, where it might be even more affordable. After 8 hours of boat, snorkel & diving tour we arrived at the harbor. See you again, underwater world! One evening, I was just back at writing in the bar, my new roommate came to the hostel. Janosch, 27 and teacher from Munich. He is on the way to Nepal. Right, from Munich. I've heard a lot, but that's impressive. It is nice that he dedicated his trip with a donation collection to the construction of a school in Nepal and already collected over 10.000 €! Respect. However, the goal of building the school also earthquake-proof is not achieved yet. Have a look at www.cyclingfornepal.com (more information in German also here), make yourself a picture and make a small contribution. The cost of his trip is covered of course 100% by Janosch himself, all donations are going directly to the school and thus to the future of the children on site. I support this! 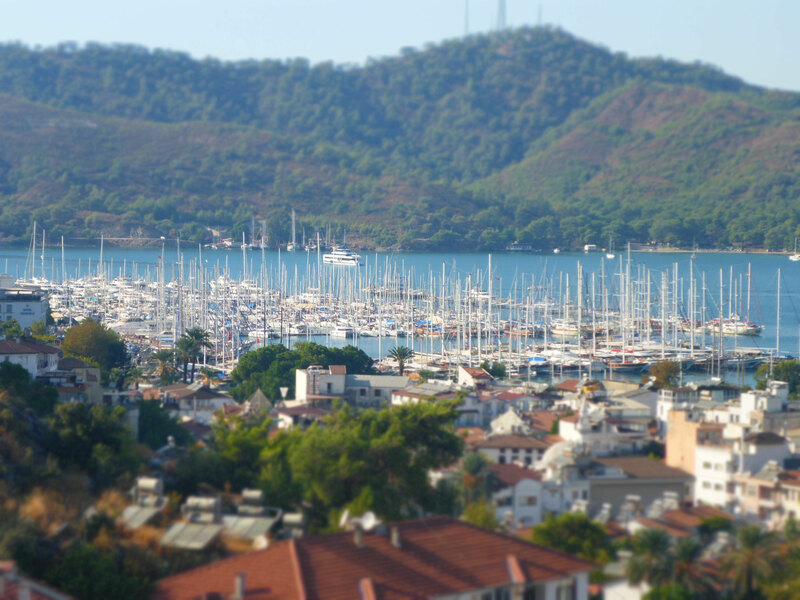 Unfortunately, Janosch could only spend two nights in Fethiye – who else has soever as much time as I do - but I immediately tried to make a trip together on the following day. 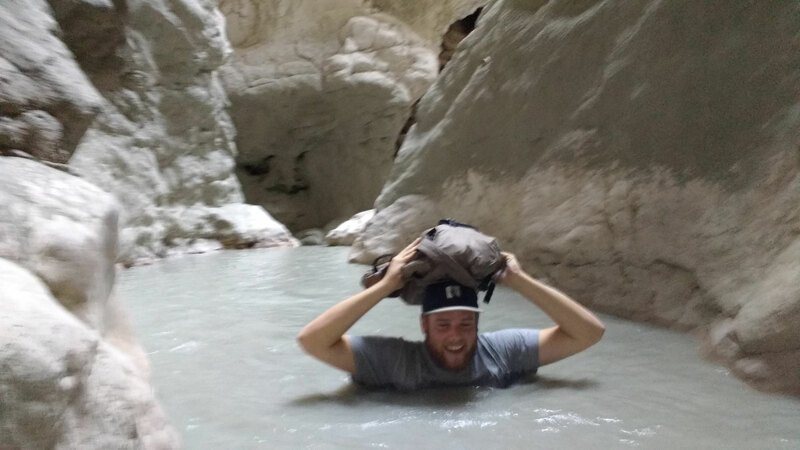 Of course I could inspire him with me to visit the gorge of Saklikent. 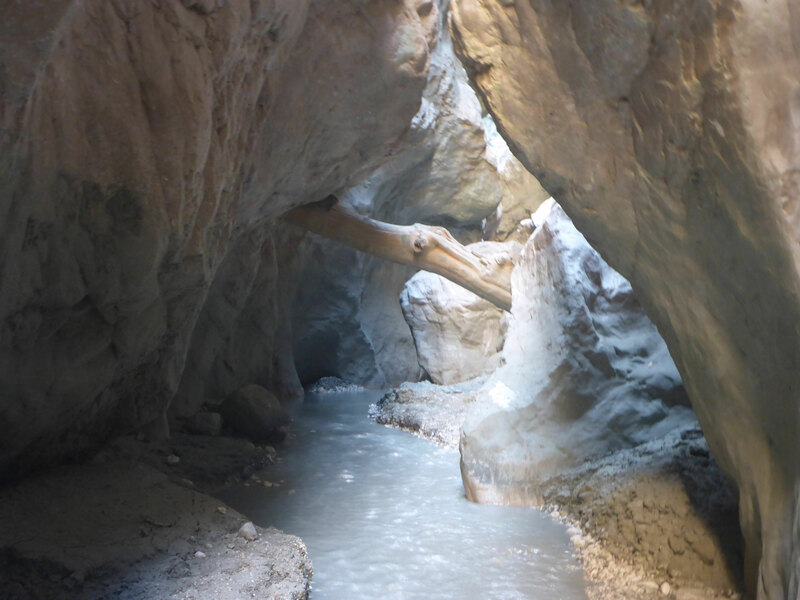 Saklikent is a nature reserve in the heart of Lycia and has, 3000m high mountains and also the gigantic river that has made its way up to a depth of 300m into the rock of the mountain. 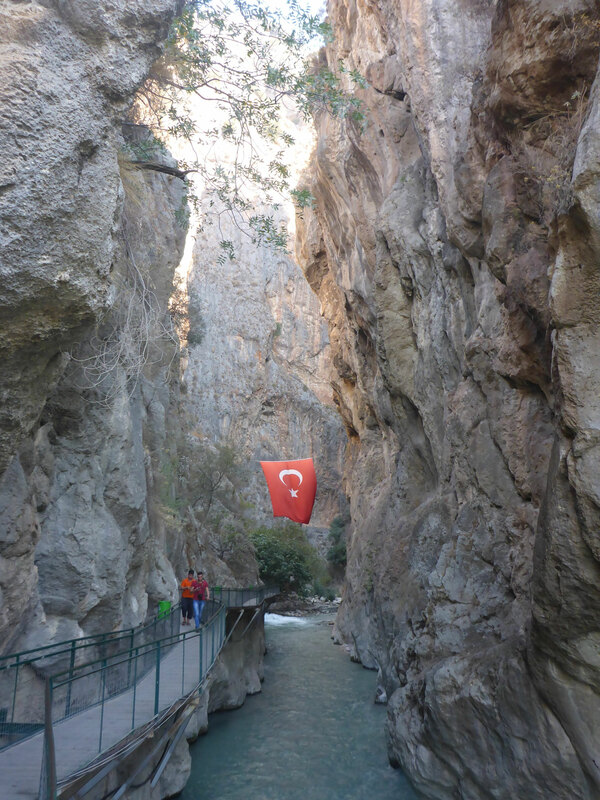 After a rough ride with the dolmus through construction sites, we reached the very touristic entrance of the gorge. Dozens of restaurants and "adventure" providers. There is probably the possibility to go by flying fox and the rafting boat on the river. But we were more likely to explore the gorge on foot. Bought tickets for a few euros and it began. Through a well-groomed wooden path, we reached some spring pots, which are holes in the rocks that push enormous amounts of water out of the ground. Then it goes through cold water. Always upstream. We refused an expensive guide. In a gorge like this one, we should not get lost. 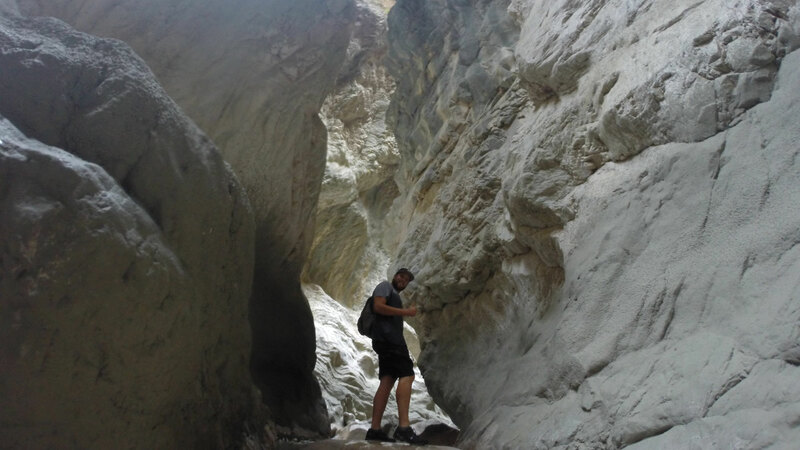 This canyon is a little shorter than the Samaria gorge on Crete (report # 4), and it is only 2km uphill without climbing material, but again I was very impressed by this nature. A special feature of the water here, is that it is not only abnormally cold, but also very sludgy. Everywhere in the river bed is gray mud to be found and partly to wade through. Of course, a supposedly healing and nourishing effect of the mud is sold here. It was amusing, but we did not have a mud bath. Well, Janosch once stood waist-deep in it, but rather from misfortune. Without help he would have had a hard time coming out here again. We continued along the path which became more and more narrow, wet and dark. Partly the water reached up to our shoulders and we had a lot of fun when we staggered through the opaque water. Finally we arrived at the end and turning point of our river tour. A waterfall, which we accepted was not able to climb up after a couple of tries where we could stop and eat lunch here. It was our advantage that hardly any other tourists were to be seen. 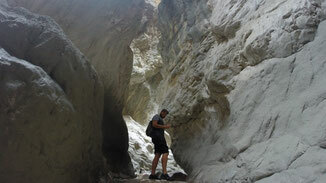 It is certainly a popular place for people, but we have seen only a few hiking groups in the entire gorge. Somehow on the way back I could hardly feel my feet and Janosch was also frozen. 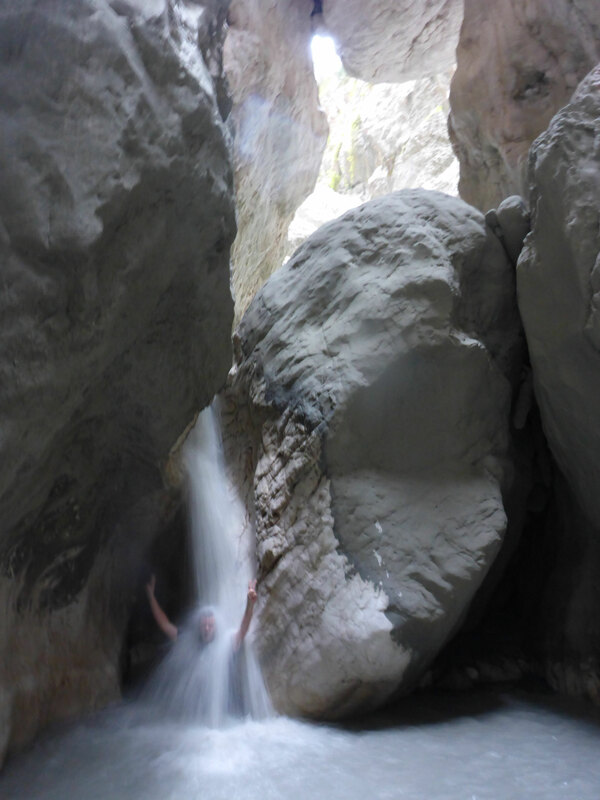 The shower under the waterfall was nevertheless worth it. However, we had to gather all of our courage to jump back into the clear spring water at the exit to remove the mud of the body and clothes. It was a very nice day and I am happy to have found a new friend in Janosch. On my last day, while Janosch spontaneously went on a paraglide, I went on a day hike along the coast. 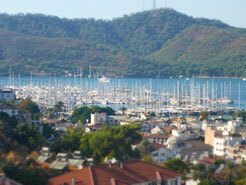 Fethiye is the starting point or end of a famous and wonderful long-distance hiking trail. 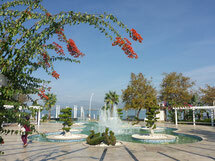 The other end is about 420 kms further east in Antalya. 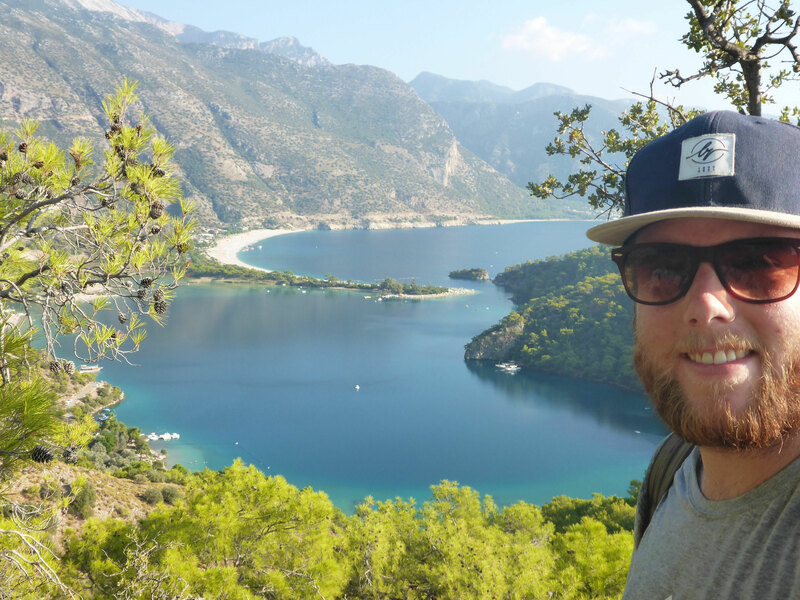 I like to travel with my friends from my birthplace on long-distance trips and this, the Lycian way, is definitely high up on the list of my suggestions for future hikes. In any case, I did not want to start this huge march by myself, but I needed to get an impression of it at least. So I went uphill from the hostel and reached an abandoned city after about three hours, through a beautiful forest landscape. This is also advertised everywhere and is, of course, also developed for tourists. Here Greeks used to live, who were forced to move after the Greek-Turkish war in 1923, on the basis of the peace agreement of Lausanne, were forcibly resettled in the course of the organized exchange of peoples. And since no Turks settled the city, so nowadays this city is a ghost town, which is slowly but surely recaptured by nature again. Well ... not really, as now the tourists claim the land for themselves. But still, it was an unusual feeling to stroll through the streets of the city and explore the ruins of the houses, churches and squares. fascinating bay, which had already been used as a landing stage for my paragliding. Here, of course, I could not miss to take a leap into the sea and enjoyed a cold cola, while the sun lay slowly behind a hill. That was my sign to go home. Since I walked all day and the bus back costs me only 1.28 €! But no bus can give what the hiking gives you! 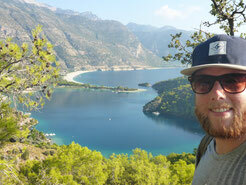 When I arrived at the hostel, Janosch was already back on his bike in the direction of Antalya. And right there I'll go next. I have already arranged with him there, but I will be - lazy dog – there a bit earlier by bus of course. A few days ago there was a bomb attack in Antalya, but they are also in Paris or Brussels. I will not let that go astray. I look forward to getting to know the city. - No second too soon! On the way to Fethiye, through fantastic mountain passes, we stopped for a break. A woman with a child get out and vomit ... both! - My Chinese roommate is sommelier by profession. She told me the great wines of Baden-Wuerttemberg was not known by her ... or has maybe heard of it. Philistine! - The South Korean, on the other hand, is already traveling 25,000 kilometers from South Korea by motorbike. - I`m an idiot, of course I forgot to hand out my hostel key. Fortunately, it came in to my mind at the bus station and I could store it there. Please visit the german version of this article to see more pictures in the photo gallery!